Spread throughout the landscape of the southern and the eastern parts of the Netherlands are a number of large boulders, loosely placed in the rural landscape, in city squares or, in one case, close to the John Frost Bridge in the city of Arnhem, which was bridge central in the Battle of Arnhem in 1944. The alien boulders, placed mostly in the countryside, are part of the Liberation Route – a still expanding cultural route centred on events in the southern and eastern regions of the Netherlands during the final stages of the Second World War. The regions played an important role in the march of the Allies from Normandy to Berlin. In September 1944 the Allies reached the Belgian-Dutch border, and, in an attempt to end the war before Christmas, started ‘Operation Market Garden’ to invade Germany through the Netherlands. They undertook large-scale airborne-landings and an infantry advance from Belgium through Northern Brabant to the bridges over the Maas, Waal and Rhine Rivers in order to cut off the Germans in the west of the Netherlands and then to push on to the Ruhr Valley and, finally, to Berlin. Nijmegen and most parts of Northern Brabant were liberated, but the conquest of Arnhem failed, bringing millions of Dutch citizens above the Rhine to the edge of starvation that winter. The John Frost Bridge still carries symbolic meanings as the place where the liberation of Europe was temporarily halted. Each large boulder is placed in the landscape of one of the former battlefields and represents a particular, often personal story from that period of the war. These stories have been recorded and can be downloaded as MP3 files or on a smartphone. They have proved to be very popular since the public opening of the route in 2008. The stories, which can be listened to individually, have been downloaded a total of more than 60,000 times. The experiences of the soldiers and inhabitants bring the listener close to the events of the war, allowing him or her to hear about the bombings of the city around him or about the joy and relief when the food transports finally arrived. Visitors are invited to plan their own trail and means of transport between the boulders, based on their interests and other travel plans. 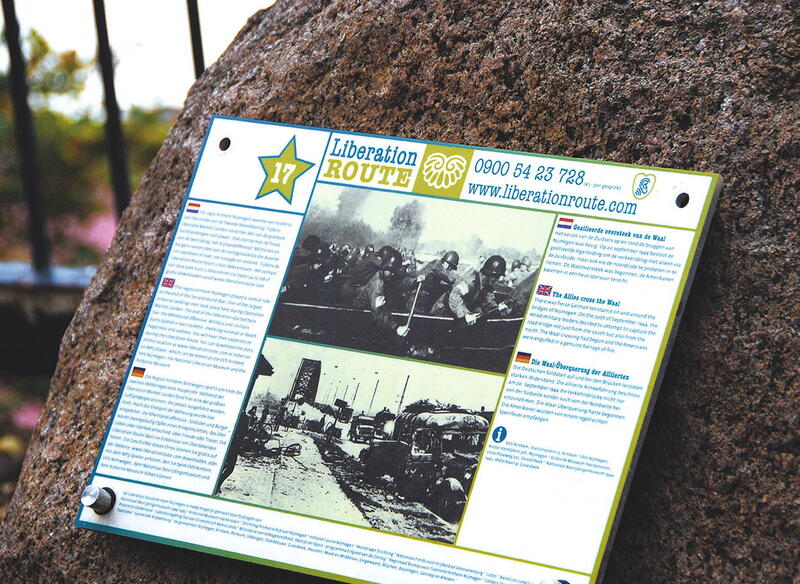 Only small-scale, ready-made tours and package deals are offered on the Liberation Route website. The ‘route’ is not a guided tour, but a network of small sites, linking the locations to a larger history and creating cohesion in the liberation story, as well as enticing the visitors to explore the whole story of the region. 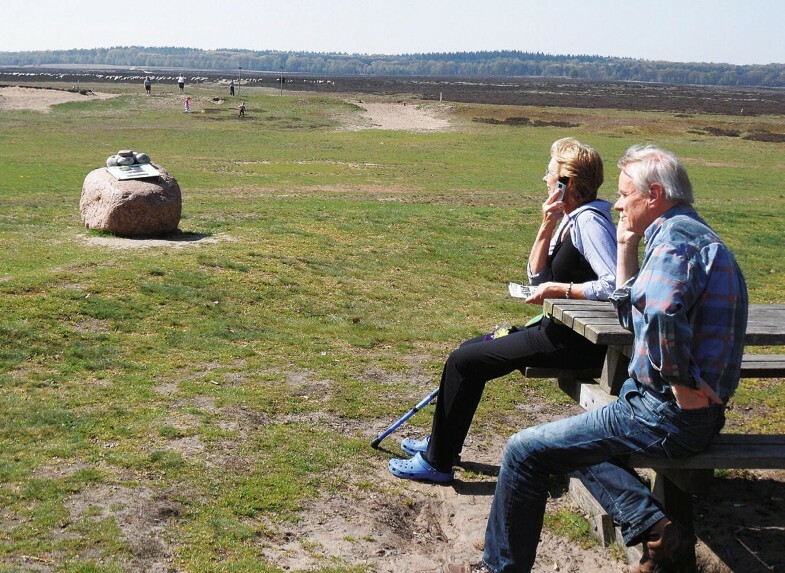 Visitors listen to the story marked by a boulder of the Liberation Route, located on the Veluwe, the Ne-therlands (DeVeluwe Flickr Channel, 2011). 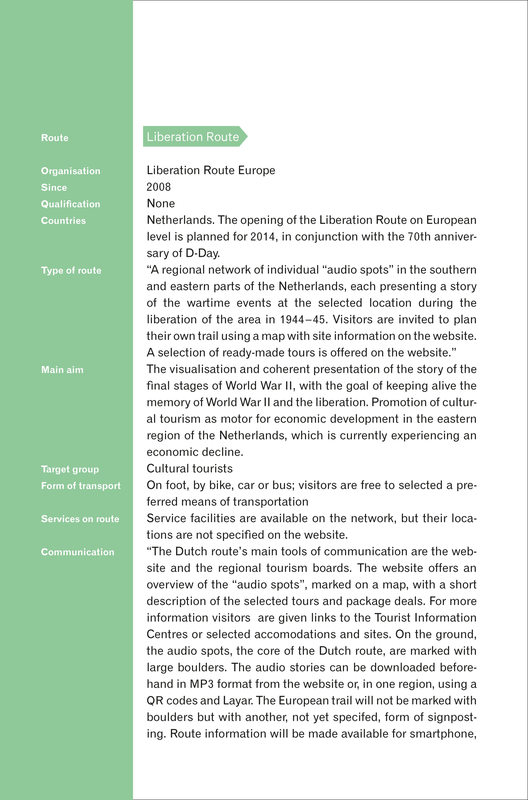 Liberation Route boulder, Gennep, the Netherlands (Linde Egberts, 2011). The method of presenting a region’s or country’s heritage to the public used by the Liberation Route is not new. In the last few decades the development of heritage or cultural routes or networks has become a popular tool in conservation, in education and in promoting tourism at the local, national and international levels. 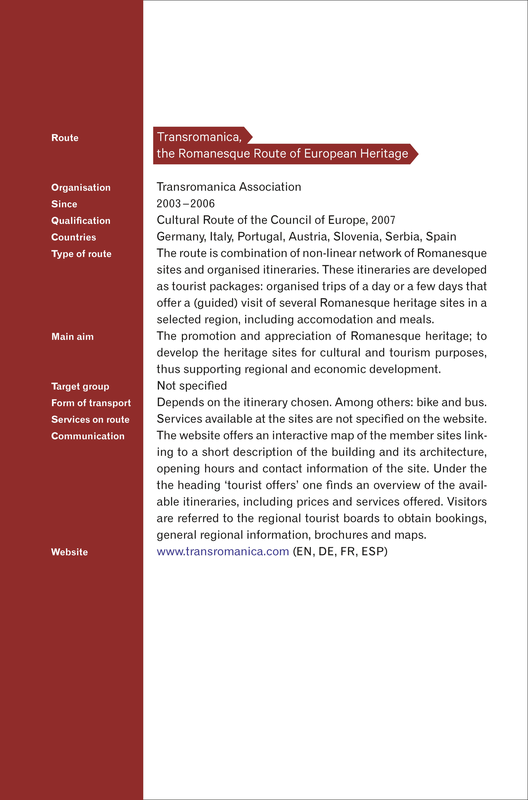 In the literature on cultural tourism, the heritage route has been defined “as a means of organising the visitor’s experience by providing a purposeful, interpreted route” that can be followed by car, bicycle, foot or other forms of transport and that “draws on the natural or cultural heritage of an area to provide an educational experience that will enhance visitor enjoyment. 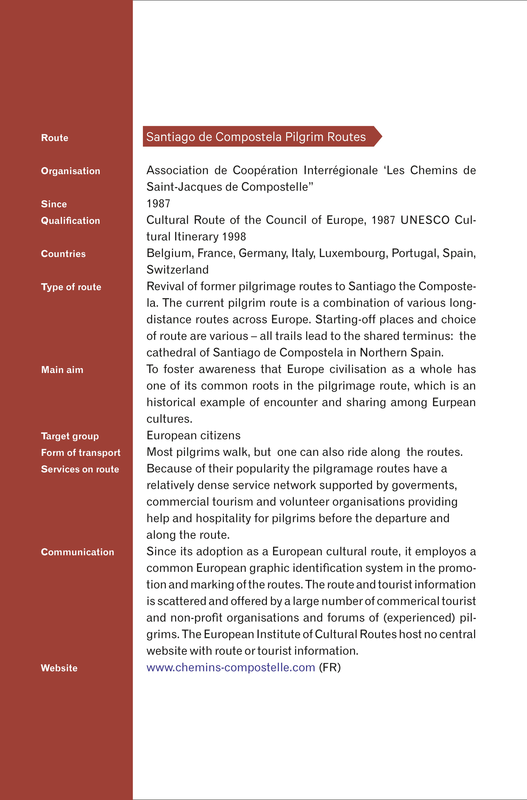 It is marked on the ground or on maps, and interpretative material is normally available to guide the visitor”.3 In practice, the scale, organisation, and content of these routes and networks is highly diverse, ranging from local urban tours that take only half an hour to international networks like the pilgrimage route to Santiago de Compostela, a walk that can take weeks or months. 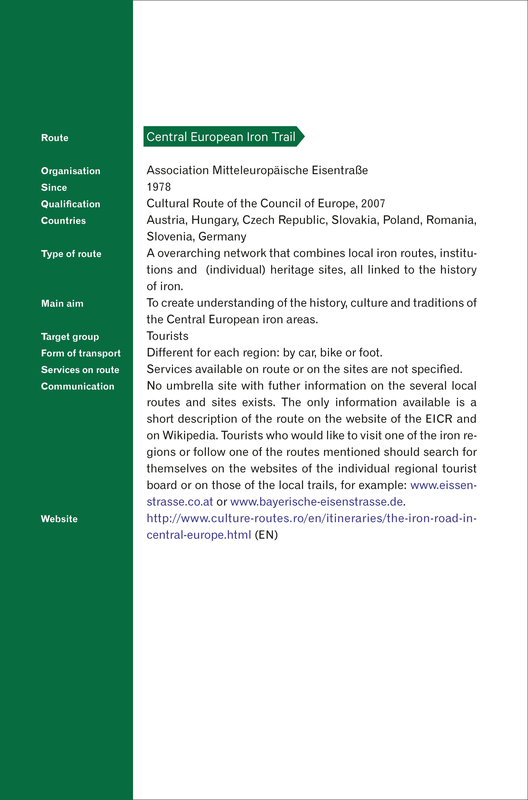 In essence, every heritage route connects several sites under a common theme. Its essential goal is to encourage a desire to travel and to cross borders, and to expand the visitor’s grasp of local, national, or international histories. An important aspect of this kind of travel is the physical experience of the journey. Unlike the planned itinerary leading to one’s holiday destination, the journey across the landscape as one follows a cultural route is as important as the destination itself. For the pilgrimage tourist, the journey to reach the religious site in question is in itself a ‘spiritual odyssey’ – a search for something deeper: a chance to meditate, to make contact with nature and other people, and to reaffirm and strengthen one’s faith during the sequence of religiously significant stops. The hardship and meditation en route culminate in a peak religious experience upon one’s reaching the final destination. The non-religious journey of the cultural tourist is more focused on submersion in the landscape, the encounter with beautiful nature or culture, and meeting other people, or the physical challenge of walking or cycling (long) distances. In both cases, however, the traversal of the landscape is a central aspect of the total experience of the route. 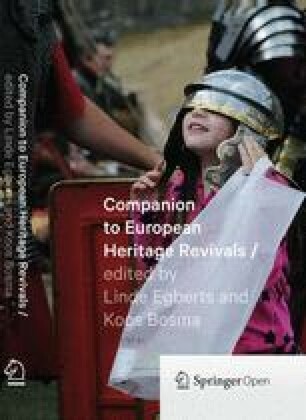 This chapter evaluates the potential of the development of cultural routes as a method for the revival of interest in and the presentation of heritage at a European level. 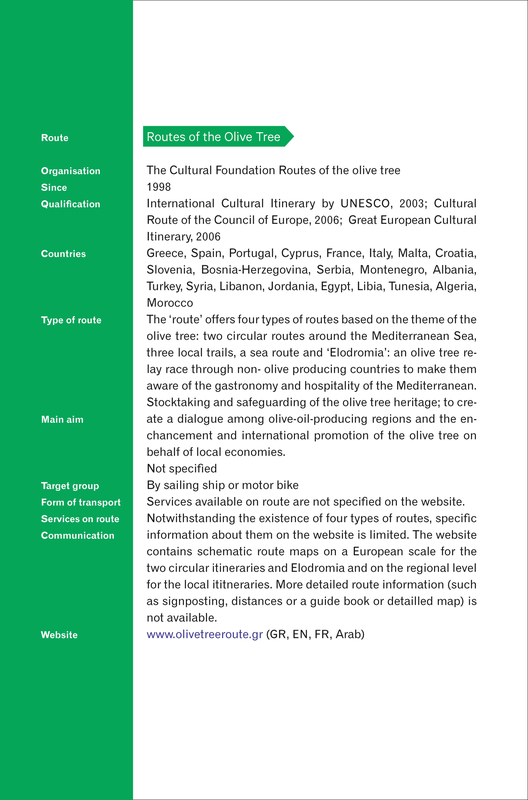 Based on an analysis of 35 existing European cultural or heritage routes, it describes some of the factors that have contributed to the successful development of such routes, as well as some of the obstacles that have been encountered, and it offers suggestions for the development of cultural routes on a supra-national scale (see matrix).4 For all 35 case studies, I have researched the route’s organisation, form, goal, and presentation using its website or a brochure (if available). 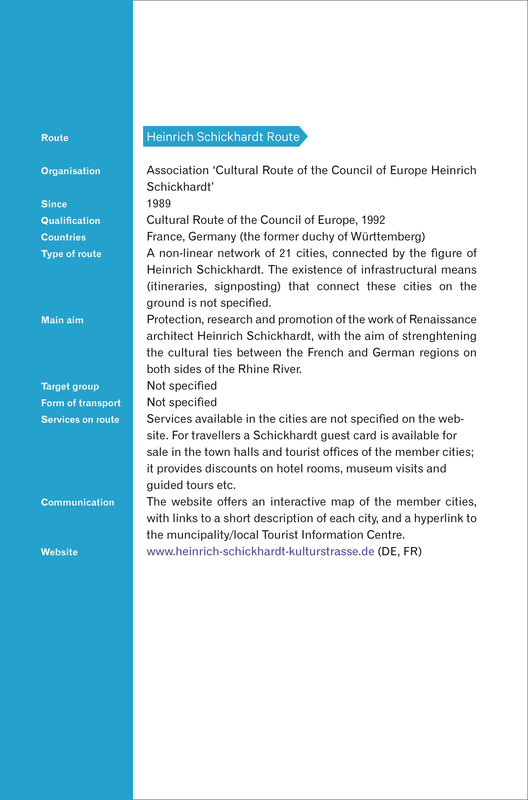 The results of this research are discussed after an introduction on the history of the heritage route. 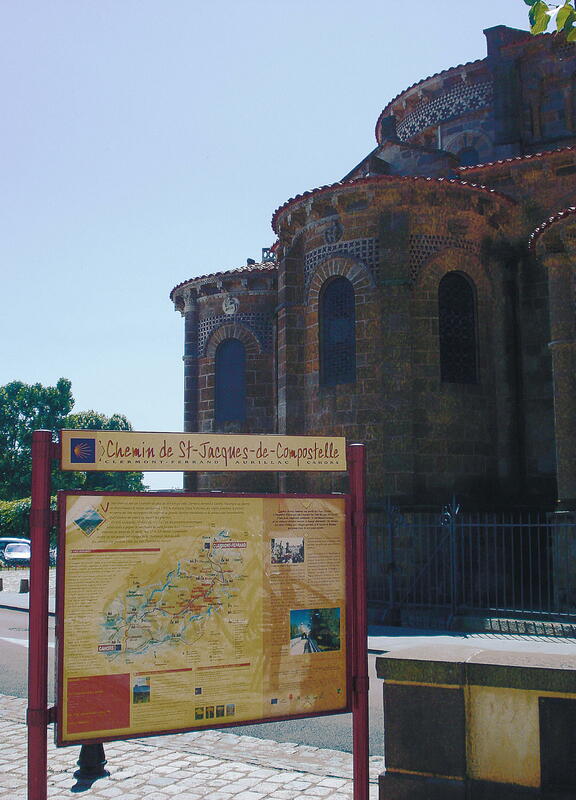 Signpost of the Saint James Way, Issoire, France (Minke Walda, 2012). Grand Tour: Bernardo Bellotto: Ruins of the Forum, Rome. Ca. 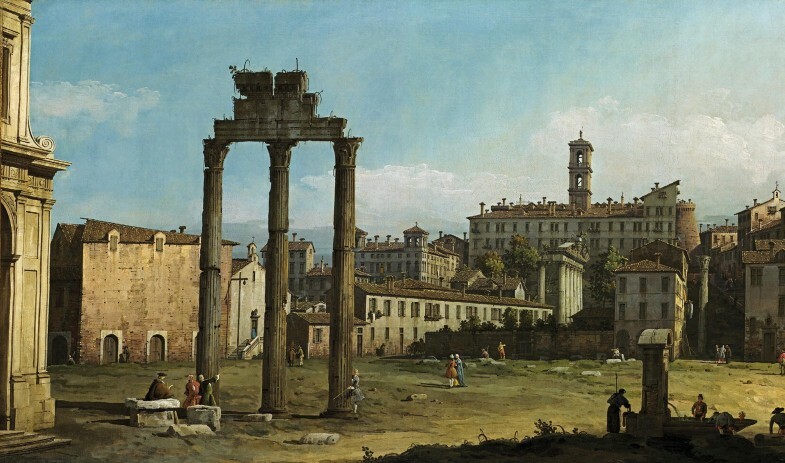 1743 (National Gallery of Victoria, Melbourne / Felton Bequest). My research on existing European routes indicates that their development at the Contintental level is strongly rooted in political-ideological agendas. Lofty ambitions are proclaimed for these subsidised cultural routes, and they are seen by their creators as multifaceted and flexible tools for promoting three goals: cultural tourism, sustainable territorial development, and European collaboration.15 The important question is: how is this institutional language translated into practice? Let me offer a few observations in this regard. 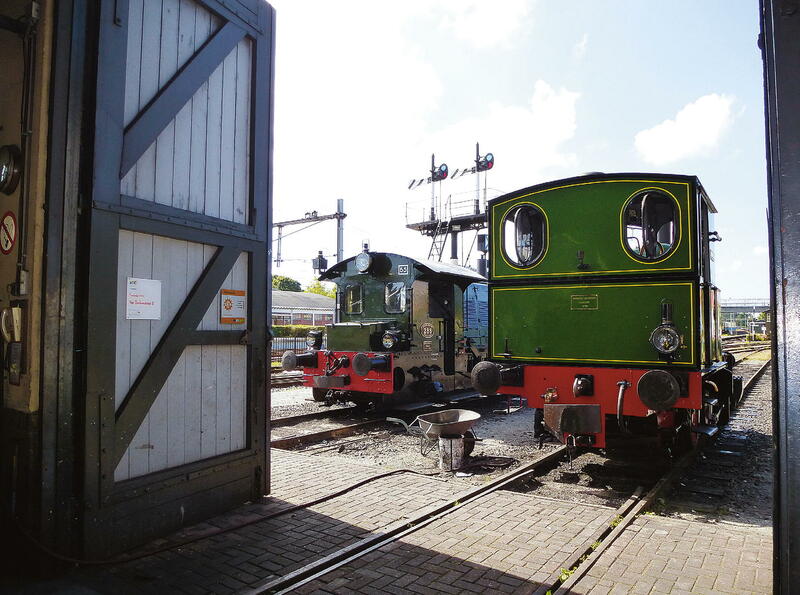 “Anchor point” of the Liberation Route: Hoorn-Medemblik Steam Tram Museum, the Netherlands (Minke Walda, 2012). 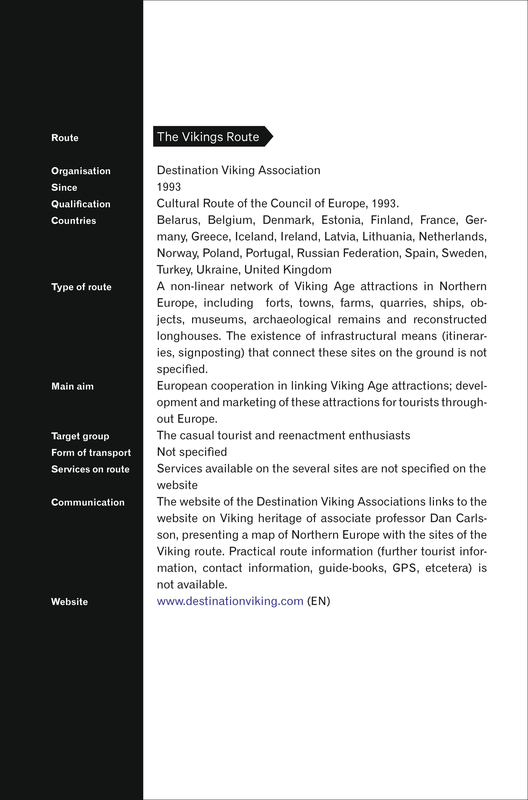 In the Introduction, fostering the desire to travel was mentioned as the essential element of route-development, distinguishing it from other methods of heritage revival and promotion. 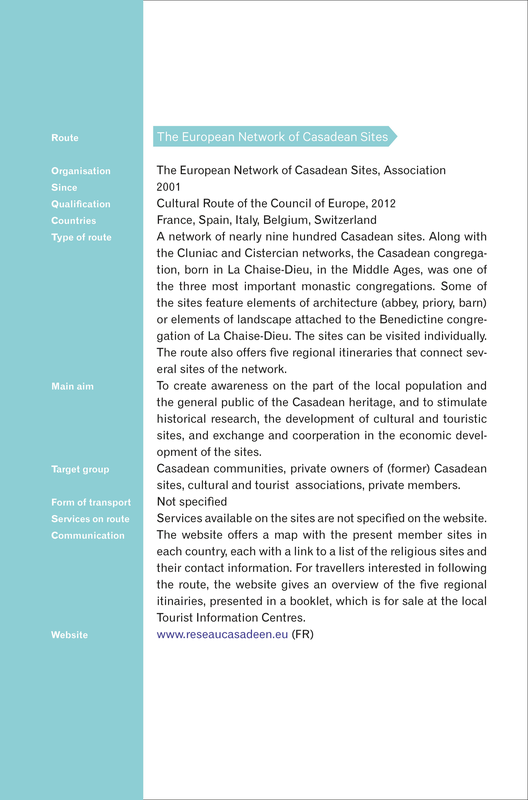 Routes serve to connect, by combining heritage sites in a larger context, but also because of the co-operation they necessitate between participants and stakeholders. In this way, a route can draw attention to heritage sites that would not have attracted the public as destinations in their own right. Embedding heritage sites in a larger geographical and cultural context also makes the cultural route an attractive tool for focusing on broader histories, such as those of pilgrimages, battlefields (Liberation Route), or the spread of artistic and architectural styles. The combined experience of sites makes it possible for the traveller to understand places in the context of time and space. In their influential publication on economic management, The Experience Economy: Work is Theatre and Every Business a Stage (1999), economists Pine and Gilmore introduced the term ‘experience economy’ as the fourth economic stage in mankind’s history, after the extraction of commodities from the earth, the production of goods, and the delivery of services. Not goods and services, but experiences are the central economic offering in this experience economy. As the authors observe, consumers are increasingly demanding experiences, and more and more companies are responding to this demand. Well-known examples are Disneyland, or, at a much smaller scale, the luxurious coffee bar, where serving a cup of coffee is staged as a total experience by offering a range of different tastes, design interiors and subtle ‘scent machines’, spreading the aroma of freshly-brewed coffee and just-baked bread. This staging of experiences, they assert, creates a closer link between the consumer and the company, leading to a stronger engagement and identification with the product. Although staged experiences like Disneyland have a somewhat dubious status in the heritage world because of their lack of authenticity, the developer of cultural routes could learn a great deal from the principles of the experience economy as described by Pine and Gilmore. The sense of history visitors gain by walking in the footsteps of the past, following a historic route or visiting historic locations, offers organizers of heritage routes a good incentive to develop an experience-based tourism likely to stimulate an involvement and identification with European heritage. 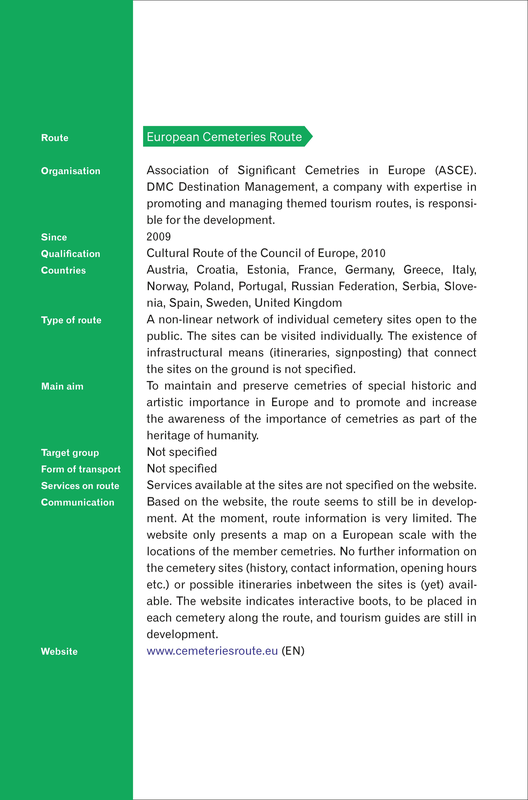 In addition, the possibility of combining several heritage sites and routes offers organizers a chance to adjust to the individual needs and expectations of a variety of user groups. Deborah Hayes and Nicola MacLeod were the first to make a connection between the design of heritage trails and the opportunities of the ‘experience economy’. 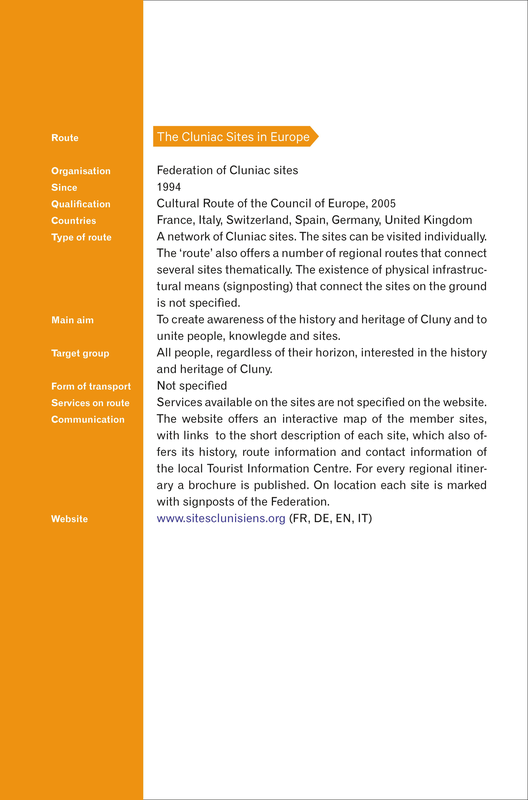 Drawing on the content analysis of trail brochures in Great Britain that they presented in their article ‘Packaging places: designing heritage trails using an experience economy perspective to maximize visitor engagement’ (2007), Hayes and MacLeod concluded that most British route-developers do not take full advantage of the potential offered by the principles of experience-based design suggested by Pine and Gilmore. Their analysis of heritage trails in Great Britain holds lessons for Continental route planners, as well. 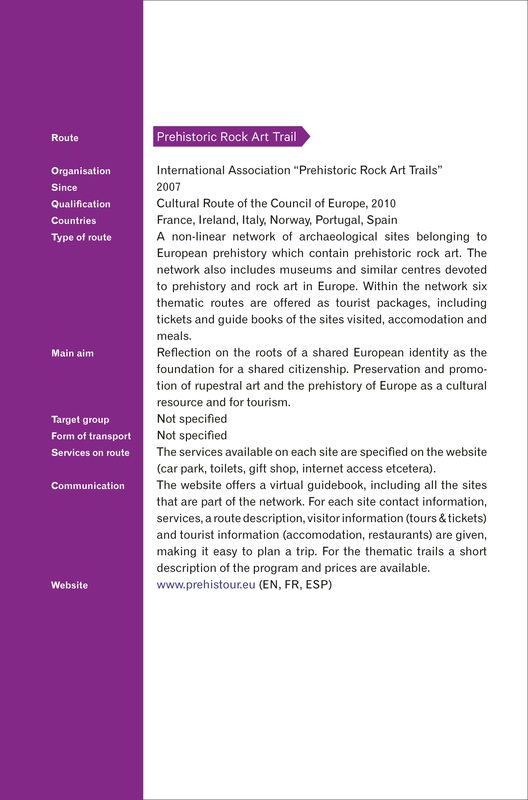 Keeping their findings in mind, I analyzed the websites of the European cultural routes and observed two major problems that need to be addressed. 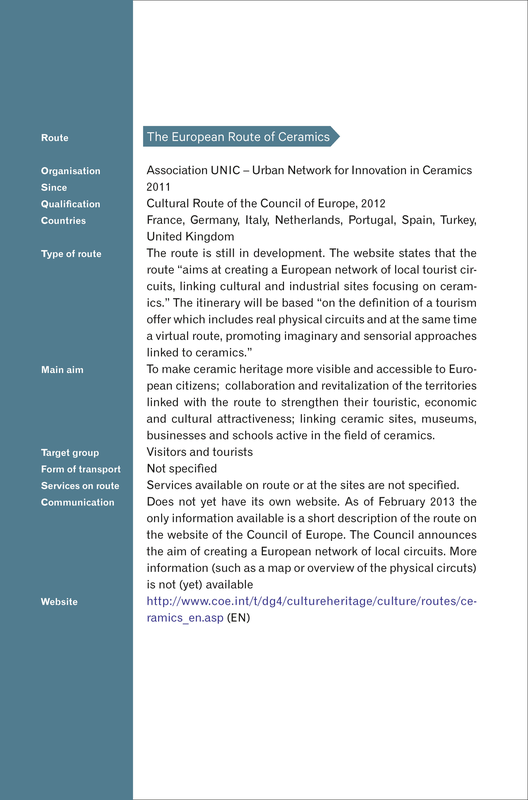 In many cases, the term ‘route’ is used to indicate the joint presentation of heritage at several locations, connected by (digital) infrastructural means. 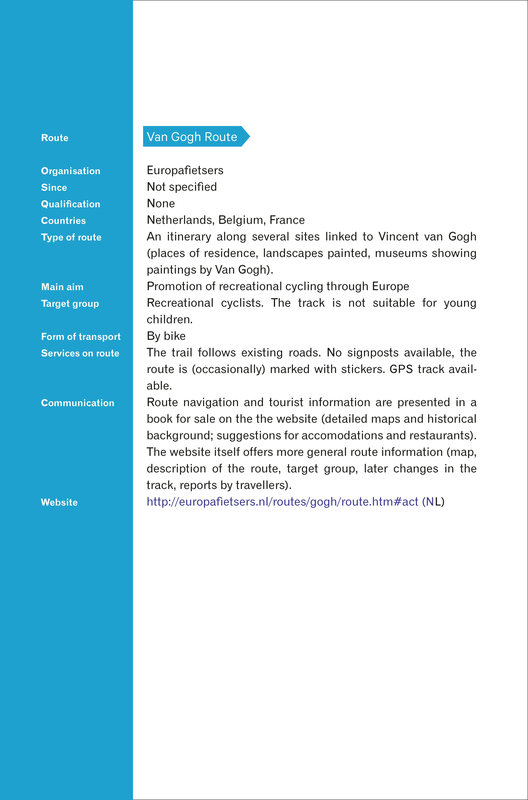 The term ‘route’ suggests a fixed trail marked on the ground or on maps, leading travellers from one destination to the next, like the many pilgrimage routes crossing Europe. The ‘route’ exists in space: it makes use of existing, sometimes historical roads or trails, marked by signposts that can be followed on foot, on a bike or by car. A cultural route, however, does not have to be a physical path. 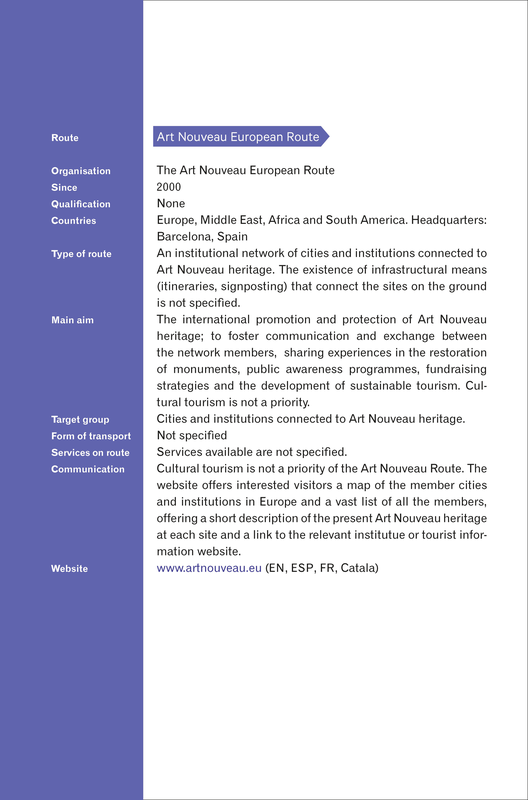 At the Continental scale, more than half of the so-called ‘cultural routes’ take the form of network organisations, lacking an actual spatial itinerary on the ground. 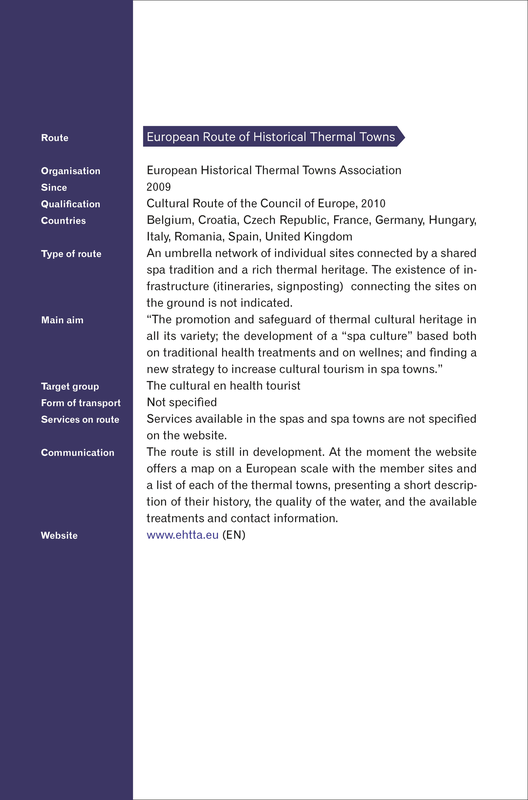 A good example is the European Route of Historic Thermal Towns, developed by the European Historic Thermal Towns Association, a network of towns in Western and Eastern European countries that boast a recognised spa tradition and spa or thermal heritage.17 The ‘route’ is actually a network of heritage sites, collaborating on an institutional level and linked by the central theme of the spa. 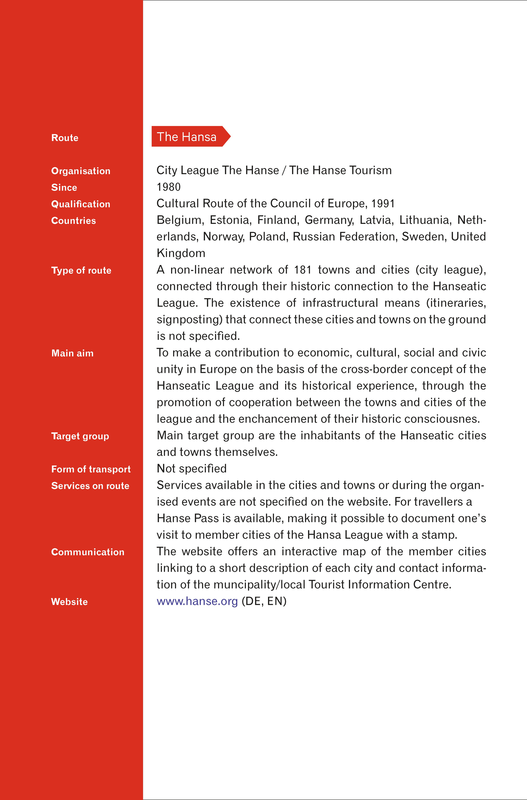 The individual thermal sites and towns can be visited separately: the website offers the contact information of a municipality and the tourist information bureau, combined with a short description of the town and its spa heritage. There is, however, no fixed trail on the ground, to guide the visitor from site to site. 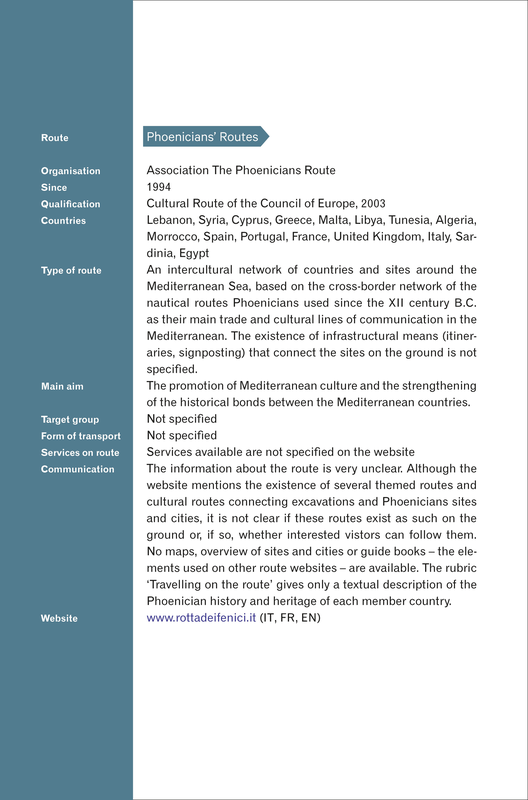 In terms of presentation, most of the websites of the network routes offer only a very schematic map of the ‘route’ at the European level, concentrating instead on an overview of the various locations. Their websites – for example, that of the Parks and Gardens route – often fail to make it clear if there exists a tangible route on the ground. 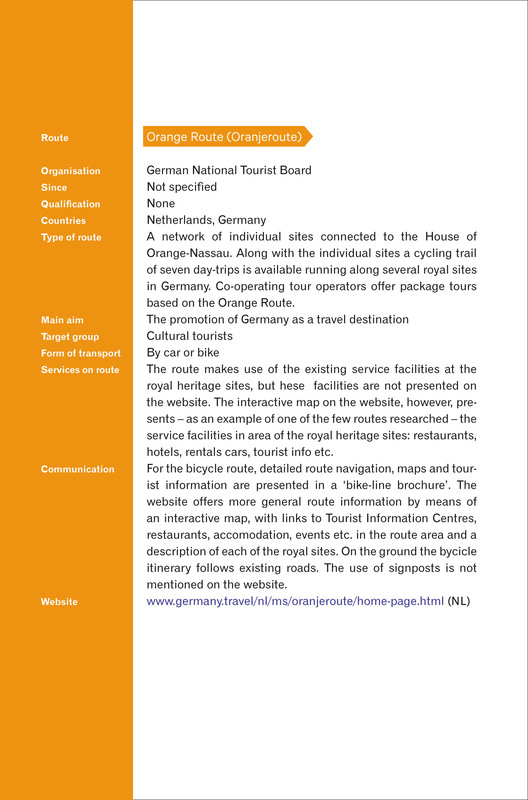 In these cases, the question then arises of whether the label ‘route’ is really applicable, as it might give rise to false expectations on the part of potential visitors. 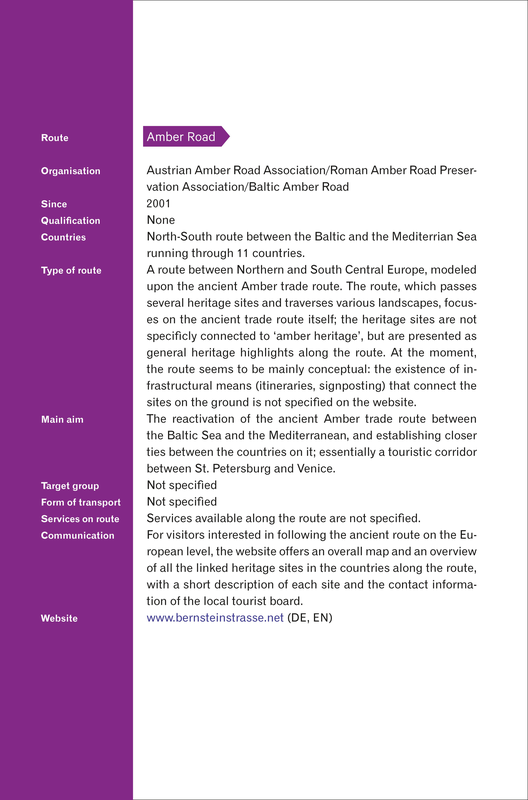 More important, the message of a shared European heritage and identity might be difficult to convey when a route consists only of nodes, separated by (sometimes) considerable distances. One needs to ask which target groups may have the time, endurance and means to invest in following these routes. 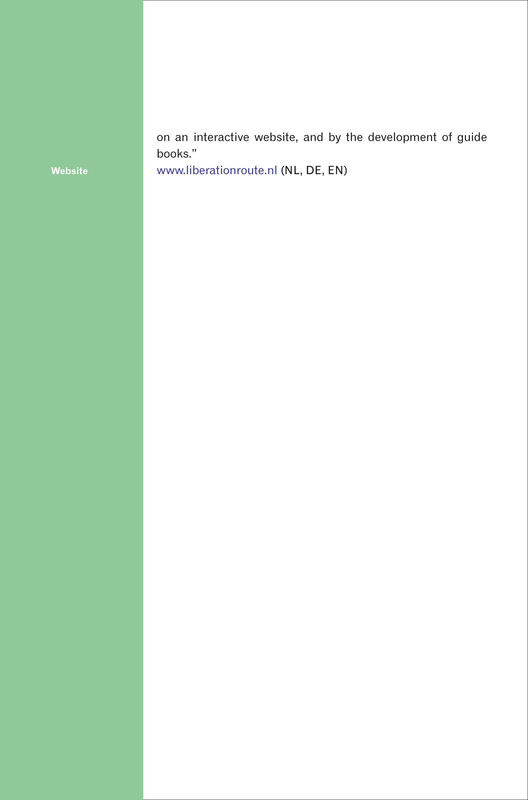 A second shortcoming in European route-development is a dearth of information. 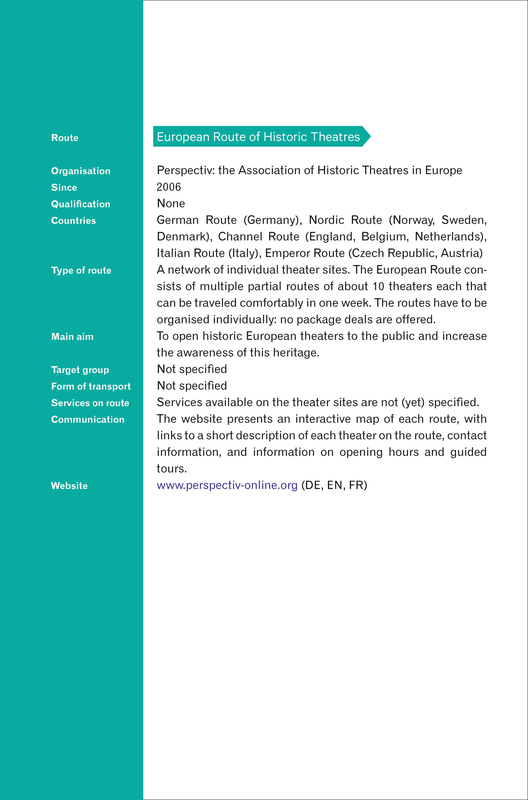 Despite the high level of institutionalization of European heritage routes, most academic researchers on heritage trails have observed a lack of monitoring and evaluation of heritage routes on the local, national and European levels. 20 In the case of the Liberation Route, the number of 60,000 downloaded stories mentioned above is the result of a one-time monitoring of only one year. 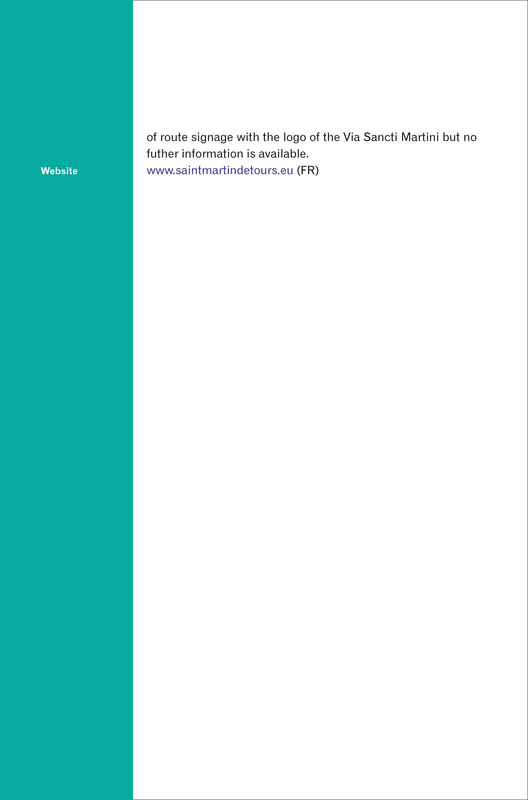 21 And, for most of the European routes that have been analysed it is unclear if specific information is available on even the number of people actually visiting the route or network, let alone on their experiences and opinions. This lack of visitor information may be an indication of the low priority accorded to thinking about the needs of potential user groups. 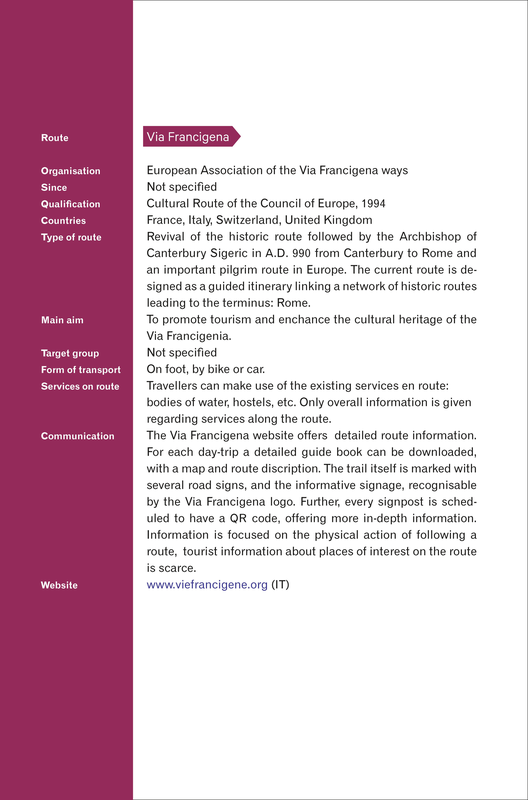 Most routes are now targeted at the generic European visitor or visitors from abroad. 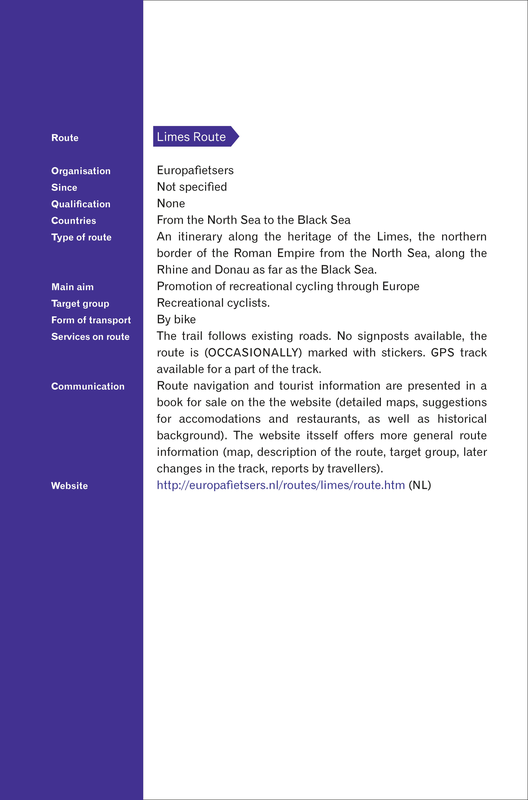 Clearly, the potential for adjusting a route to the more individual needs and expectations of a variety of user groups cannot be fully exploited in the absence of visitor information. This lack of monitoring is especially surprising considering the high ambitions stated by many routes with respect to promoting cultural tourism, sustainable territorial development, and identity-construction. It should be noted that it is not only the providers, but also the visitors who lack adequate information. 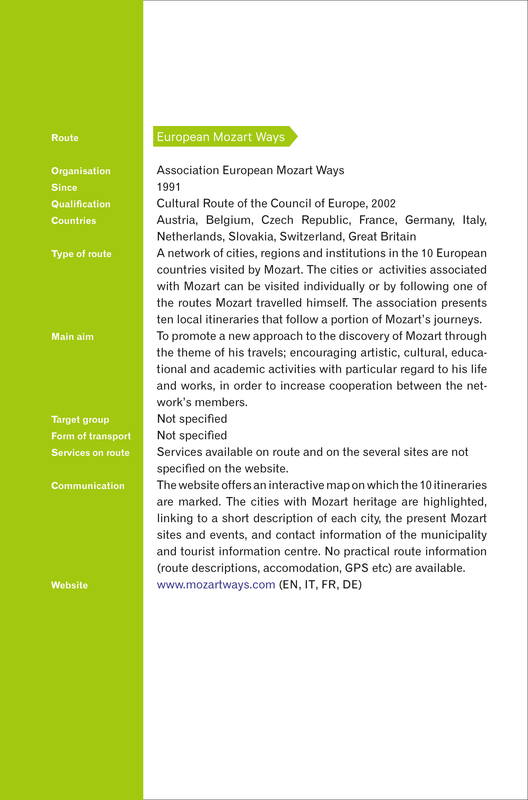 For Europeans interested in following a particular cultural route, practical information is often hard to find on the Internet. 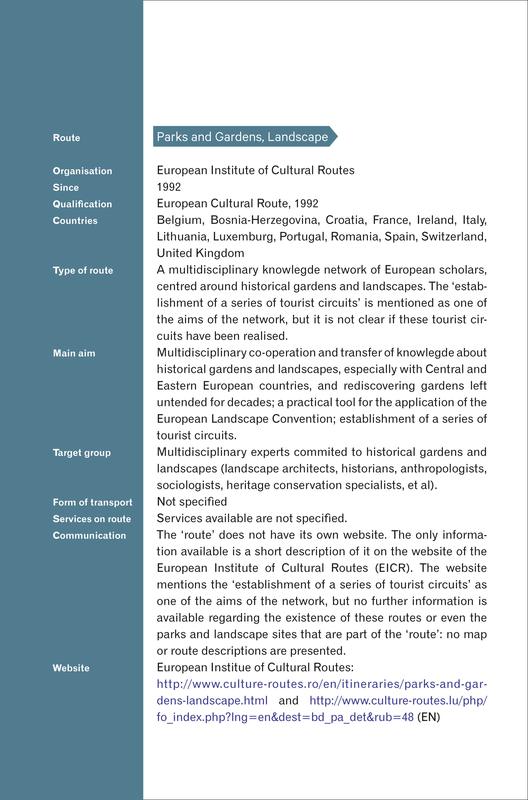 In the case of the Parks and Gardens route, the establishment of a “series of tourist circuits in a number of European regions” is mentioned on the website of the European Institute of Cultural Routes.22 However, no information on these “tourist circuits” is available, leaving it unclear just what these circuits consist of. 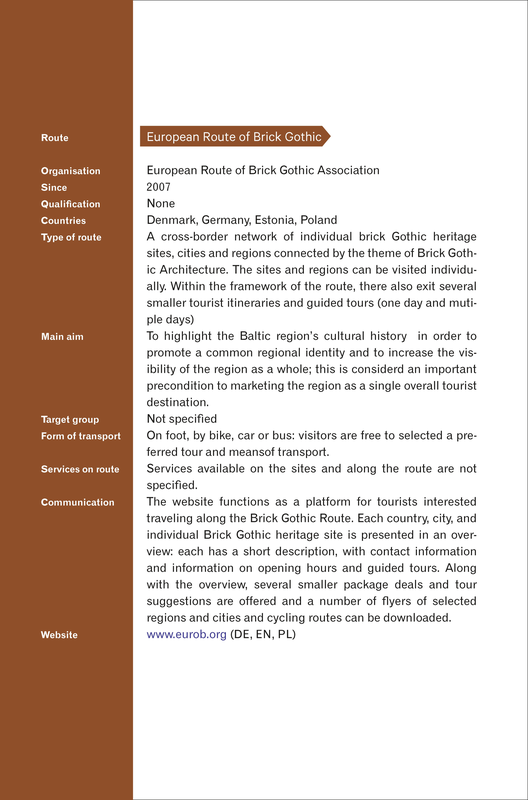 The Parks and Gardens route might be an extreme example (even to the point of lacking its own website), but many of the routes that claim to promote cultural tourism offer only minimal online tourist information concerning itinerary, actual road markings, service facilities, or the best means of transportation available. 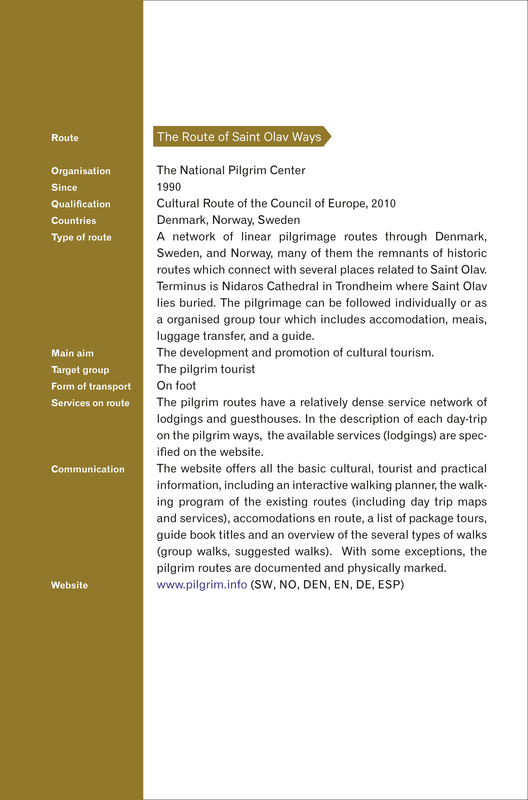 Happily, there are a few counter-examples to this tendency, including the pilgrim route called The Route of Saint Olav Ways, the Prehistoric Rock Art Trail, and the Route of European Industrial Heritag­­­e. Lack of adequate information is the most important obstacle to route-development at the European level at this moment. The high ambitions will not be achieved if visitors are not prompted to follow a well-defined route. 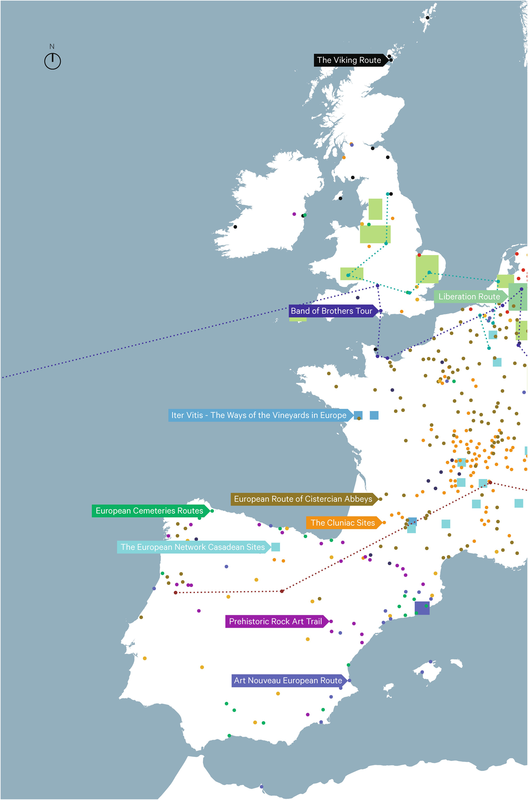 Many of the European-wide named cultural routes appear to be predominantly institutional networks or symbolic routes, without a carefully thought out and accessible itinerary or a tourist network on the ground. The idea of a route as a user product, with an active visitor component, remains underdeveloped. It is not known how many Europeans or visitors from abroad are reached, besides the professional partners of the project. The organizers of the heritage routes are thus failing to exploit their potential to become an active, experience-based form of heritage tourism. Moulin and Boniface point out that making the optimum use of such routes will require more collaboration between the tourism industry and the heritage industry.23 In attempting to develop heritage routes one could learn much from the promotional methods and user-group approach employed by the tourist industry to attract visitors. 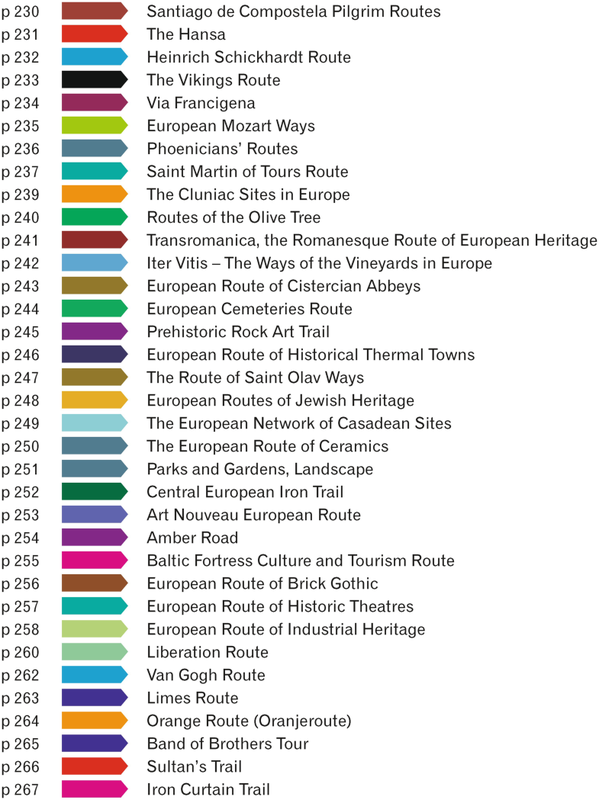 Such knowledge could be used to maximize the potential of these routes to generate a revival of interest in heritage on a European scale. 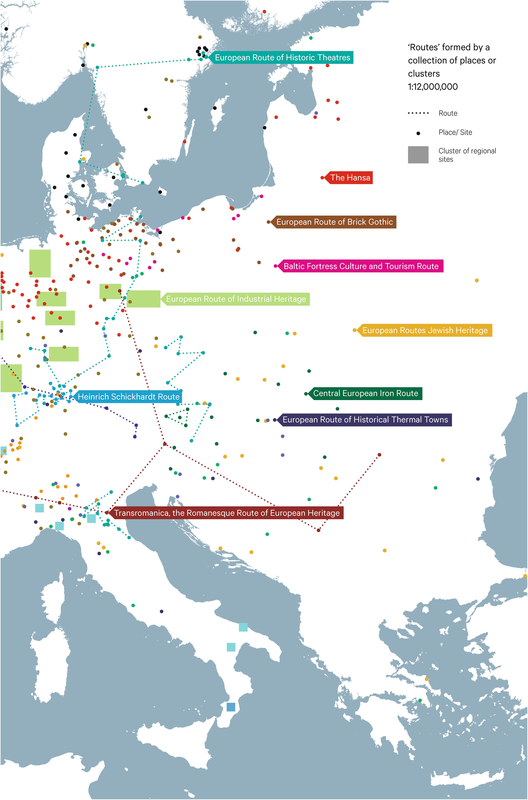 To revive and promote interest in Europe’s common heritage, we should create routes that take advantage of the current widely felt need to experience the past. Because such routes require one to travel in order to visit historic heritage sites ‘in situ’, they have a high potential to deliver such an experience. 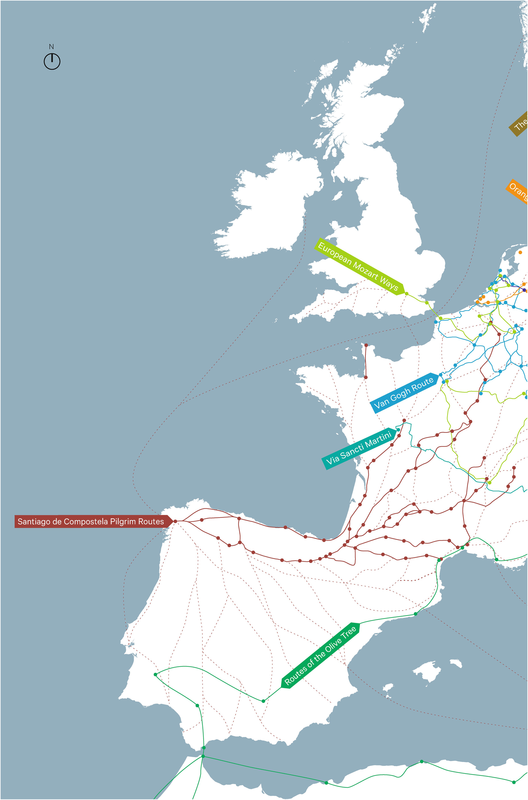 However, the evaluation of existing European routes has clearly shown that this potential is not being fully exploited. The diversity in trails and network route-systems makes it possible to adjust a route to the visitor’s personal tastes and available time. 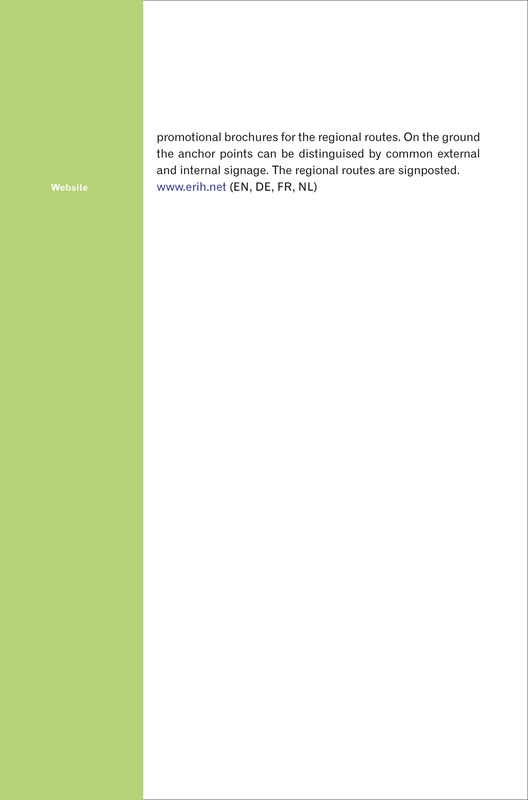 European routes, however, are handicapped by their scale, which might be too large for some of the target groups of European citizens to grasp and to traverse completely. Only some target groups, for example wealthy seniors from Europe and abroad, may have the time and means to participate in these routes. 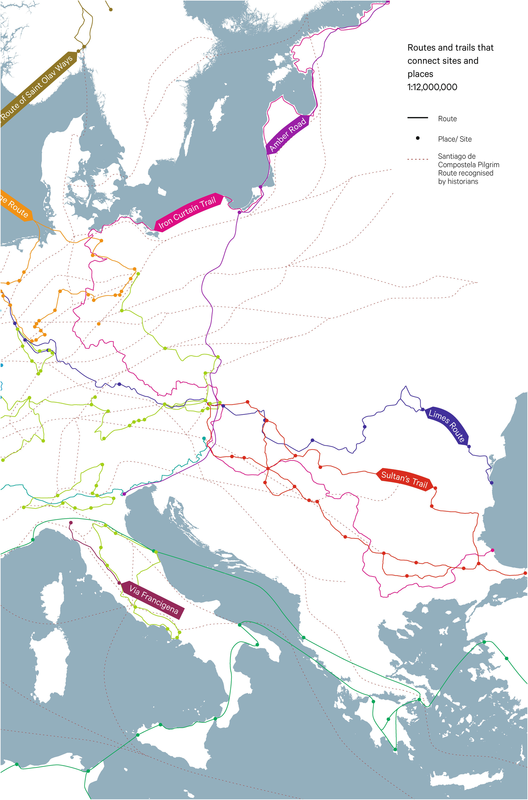 In addition, the message of a shared European heritage and identity can be difficult to convey when a route consists only of nodes, separated, in some instances, by sizeable distances. 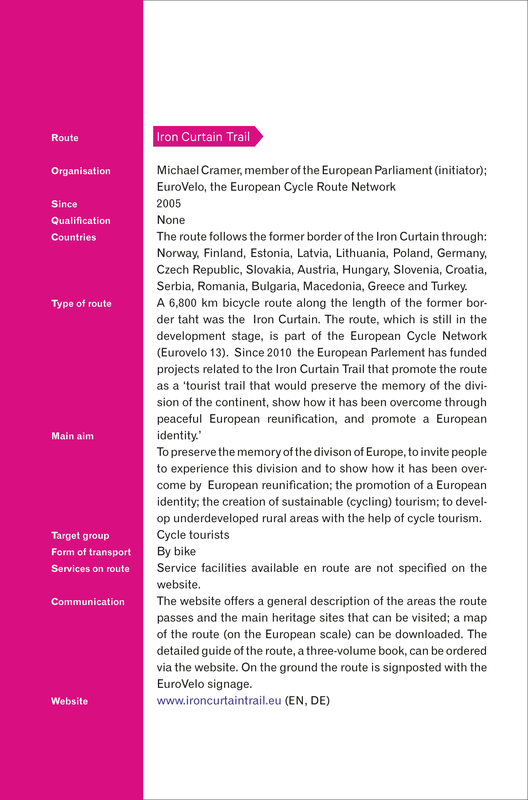 Considering this fact, it is remarkable how little attention is currently devoted to the trails and landscapes that connect the nodes – a central aspect of the experience of any route – and to the transport available in the routes that have been studied. 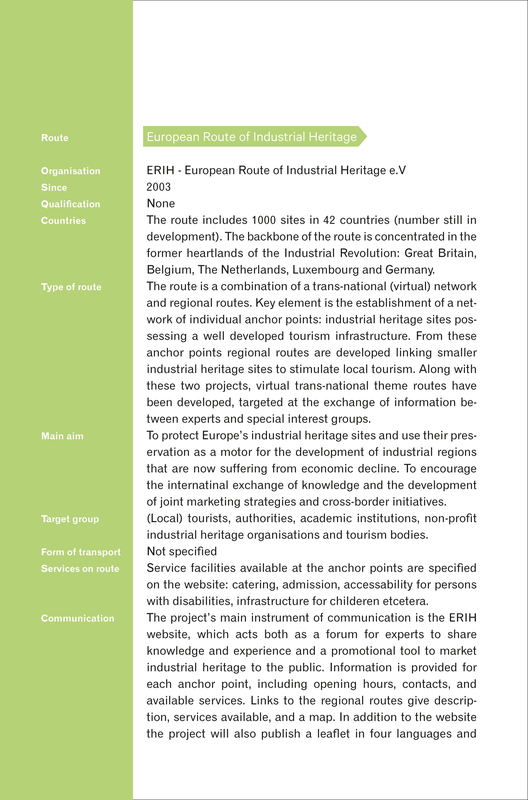 The development of sub-routes that cover a representative part of the route could offer a more accessible experience, the Route of European Industrial Heritage being a good example of this practice. The successful development of heritage routes requires an intensive involvement on the part of the visiting public. Visitors need help in following a long route or one that includes several heritage sites spread over long distances. 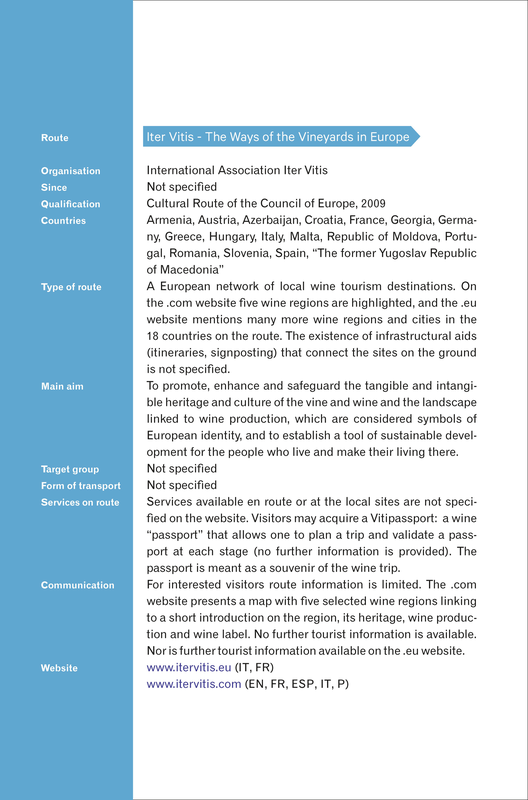 Yet, lack of information is an often occurring shortcoming of the current European routes. Therefore, it is crucial to provide visitors more information, and to do so in a form that takes into account their desire to experience things and places directly for themselves. 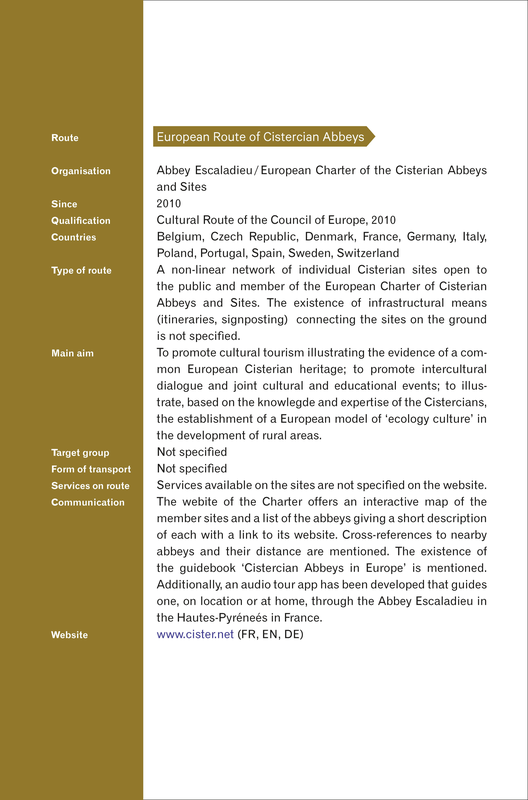 Many of the co-called European heritage routes are networks of individual sites created by institutions interested mainly in promoting shared heritage and establishing cross-border partnerships to foster the exchange of knowledge and experience. 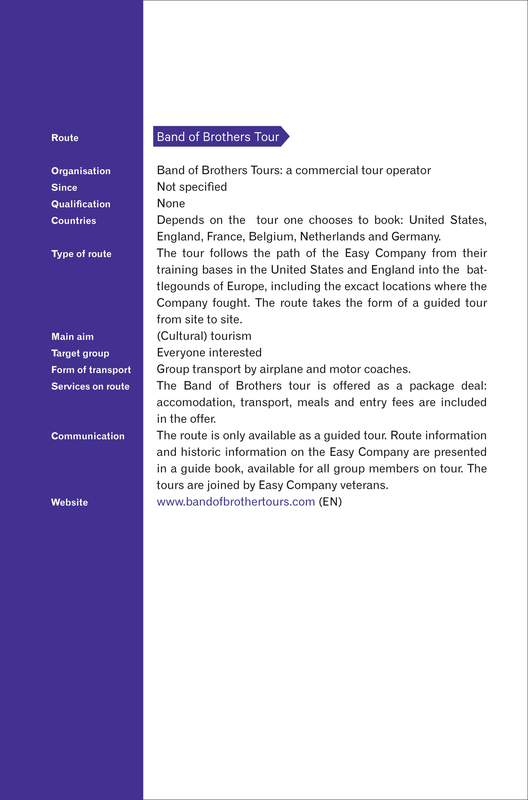 In accord with this emphasis, they have provided markedly little information geared to the individual visitor interested in actually traversing one of these routes. The widespread lack of monitoring and evaluation of these heritage routes is also striking. We must gather more data regarding visitor numbers and tourist reactions to routes, if we hope to maximize the potential of the heritage route as an instrument to revive European heritage.